EDC Las Vegas is Insomniac’s biggest party of the year, and the week leading up to it has become a calendar-worthy event unto itself. Officially dubbed “EDC Week” by Las Vegas Mayor Carolyn Goodman in 2013, it’s seven days of curated entertainment and special events, beginning the Monday before EDC and lasting through the festival weekend. EDC Week 2016 featured dozens of world-renowned artists playing to sold-out crowds across more than 20 of the best venues Las Vegas has to offer. 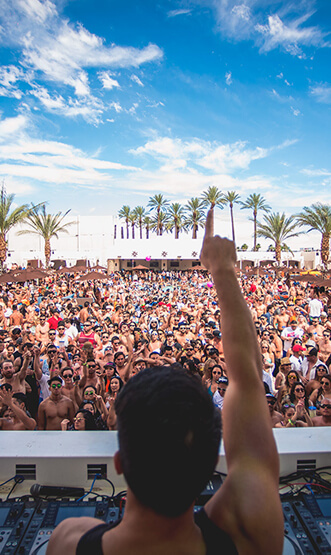 The week’s festivities also included special one-off branded events: Trance-lovers united as Dreamstate presented a curated showcase at Tao Nightclub; Bassrush brought its massive drops to Rehab Beach Club and the Joint; and Basscon introduced hard dance to the Downtown Grand’s Citrus Pool. Of course, wherever Insomniac goes, we make it a priority to give back. To show our dedication and commitment to the community that we call home for this entire week, in 2015 we launched the EDC Week Charity Auction, presented in partnership with eBay for Charity. In 2016, fans from around the world bid on nearly 75 once-in-a-lifetime opportunities with EDC artists—from a private pizza party with Martin Garrix to racing exotic cars with Marshmello. The auction raised a total of $119,941 for the Shade Tree of Las Vegas, a nonprofit organization aiding women, children, and pets that have been affected by domestic abuse and crisis.